Underage night life, is there such a thing? Sometimes it can feel like after the sun sets, life belongs to those with a legal ticket to the bars – but that is simply not true! So, here are 4 ways to embrace Madison before before the clock strikes 21. For music, check out The Orpheum or The Majestic. Head to The Comedy Club for a few laughs, or The Bartell theater for a dose of drama. Also, don’t forget to sign up for The Overture news letter to get great student deals on Broadway musicals. Don’t want to go crazy, but still want to leave the house? An evening yoga session might just be for you. The UW Madison SERF offers a 9pm power flow class on Thursday nights, while Inner Fire on East Campus Mall also offers several late night yoga classes as well! There is nothing like watching the sunset in Madison. 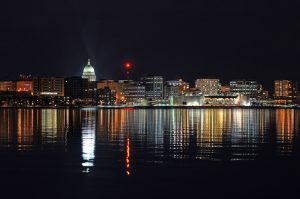 Head to the beautiful Monona terrace or even stay on campus at the Mendota docks. The sunset won’t disappoint, especially with one of Madison’s very own brats! Okay – so you want to go out, but don’t know where? Check out The Cardinal for Latin night dancing. This 18+ club will satisfy your nightlife needs without breaking the law. Trust me, this place doesn’t disappoint! Moral of the story is: don’t let the countdown to 21 bring you down. At the end of the day, YOU make your own fun, but Madison can definitely help.